VUOLAS is an accommodation product for nature tourism, combining a high standard of hotel accommodation with an intimate nature experience. The VUOLAS products are manufactured in series production at Celt Oy´s factory. The Vuolas collection will be released at Finnbuild 10.10. At the Helsinki Fair Center. Nine accommodation models are suitable for different uses and conditions. The best parts of the cottage, hotel and nature experience combine with the user in the Vuolas apartment privately. Vuolas provides a luxurious accommodation service and a gradual increase in accommodation capacity at a nature tourism areas. Separate hotel rooms also make it possible to utilize landscape environments in a variety of ways. The Vuolas modules are produced fully ready for use. For all models, frame structures are CLT (cross laminated timber). "With the Vuolas concept, we are able to meet the demands of the nature tourism industry by combining industrial timber construction and high-quality architecture," says Markus Katainen, Sales Director of Celt Oy. The smallest modules are 12 square meters and those are suitable for summer camps, for example. The largest Vuolas apartments are about 30 square meters and contain 6 sleeping places and a sauna. Most of the products in the Vuolas collection are suitable for year-round use. The Vuolas apartments are equipped as a hotel rooms with elements of holiday cottages. Press conference will be arranged at Finnbuild fair, Celt´s stand 1a21 on Wednesday, 10 October. at 10.30. Welcome! 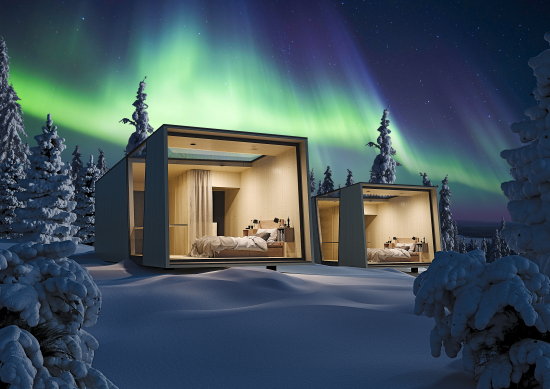 VUOLAS is a hotel room module collection developed for nature tourism. VUOLAS is a registered trademark of Celt Oy. Celt Oy manufactures CLT module apartments in Valkeakoski, Finland. Celt Modules are manufactured in dry factory conditions fully completed.